Recently a railway station in Uttar Pradesh was renamed as Pandit Deen Dayal Upadhaya Junction. The erstwhile name of the station was Mughalsarai Junction. 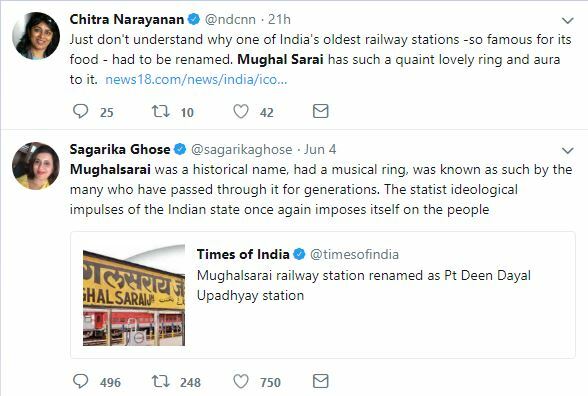 Many secular hearts wept because the station which was called ‘Mughal Sarai’ was renamed. Apparently, it had a musical ring and aura to it according to some people. The reason for renaming the station was entirely forgotten. It was the place where the Jan Sangh leader’s murdered body was found on the railway tracks of this station. The renaming is a mark of respect for the departed leader of Jan Sangh. This episode unmasks a phenomenon in the ‘intellectual’ circles of India which has not been called out in public discourse. I propose the name ‘Mughal syndrome’ for the unjustified obsession with the Mughal rule in India and an outrage over renaming of the railway station. Let us start with the example of another renaming. Akbar renamed the city as Illahabas and later, Shah Jahan renamed the city of Prayag as Allahabad (The City of Allah). What was the need for renaming it in the place considered a holy site for Hindus as a city of Allah? Clearly, he had the intention of erasing the erstwhile history and Hindu identity of the place with an Islamic name. The original name Prayag meant a ‘place for offerings‘ in Sanskrit. The Mughals have vanished, British left India and still, secular India has retained this obscene name of ‘Allahabad’ for a city considered holy for Hindus. Some Mughal emperors had Hindu mothers. So what? Some ‘intellectuals’ say that Indians must be grateful to Mughals because they settled down in India and made it their home. In fact, one journalist said that all Mughal kings were born to Hindu Rajput mothers and therefore we must be proud of Mughal history. Jahangir was born to a Hindu Rajput Queen Jodhabhai ( who is known by the name of Mariam Us Zamani ). But that did not make him a tolerant ruler. He executed the Sikh guru Arjan Dev in a brutal manner. According to Tuzuk- i-Jehangiri , a memoir written by the emperor himself, he executed Arjan Dev because Sikhism was spreading and the guru refused to convert to Islam. Having a Hindu mother did not change the nature of Mughal ruler in any way. They continued to further the cause of Islam and expansion of their empire. Question: How does the Mughal Empire fit into your narrative? Early on in the book, you note that the British were very different to previous invaders of India. Shashi Tharoor: The British were different in the sense that they had no commitment to the country. The Mughals were invaders who had come to India previously and then they stayed on and assimilated. For example, every single Mughal emperor (with the exception of the first one) was the offspring of an Indian woman. And the Mughals saw India as home: they never went back, nor did they send all their assets and resources back. They invested in India, they brought in artists and architects, doctors, musicians and painters and enriched the civilisation of this new territory. The founder of Mughal empire, Babur had originally inheritied a tiny kingdom called Ferghana. Once he defeated Ibrahim Lodi in the first Panipat war and saw the riches of India, he decided not to go back to the life of poverty in Ferghana. Therefore, Mughals did not do a favour to India by settling down in India. What was the investment of Mughals in India? The forts, palaces and monuments they built were for their personal use. The were not indulging in social sector programs like MGNREGA. All structures were built to enhance their image, power and status in the eyes of the ruled population. They not only built their structures but also destroyed those which were related to Hinduism. 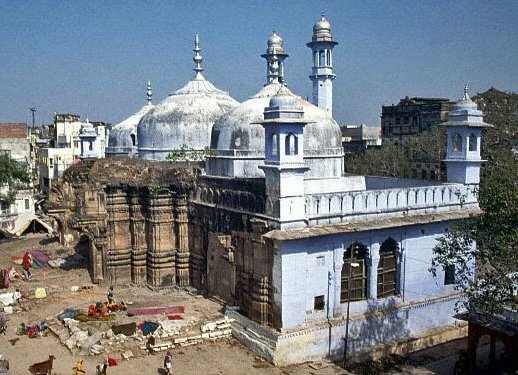 The Gyanvapi Mosque’s structure clearly indicates that it was an erstwhile temple. It was demolished under the reign of Aurangzeb. Today Hindus are still fighting to reclaim this temple in Allahabad high court. Mughals were Islamic invaders of India and they left their mark on the history of India. Their history is to be read objectively by every Hindu citizen of India. There was nothing positive about their rule worth eulogizing in the present day. The tourist revenues from Mughal monuments is perhaps the only positive impact of the Mughal rule. It is only the foolishness of certain Hindu ‘intellectuals’ that makes us feel proud about ‘Mughal invaders’ of India. The gang which harps on ‘Brahminical persecution’ of Dalits for thousands of years in India does not see a case for Muslim persecution of Hindus by Islamic invaders like Muhammed Ghori. Mughals were no different from British who sought to enjoy the wealth of India, subjugate its population and rule the land as emperors. Anyone who intends to eulogize them is only manipulating history for the sake of force – feeding secularism to the Hindu population of India.